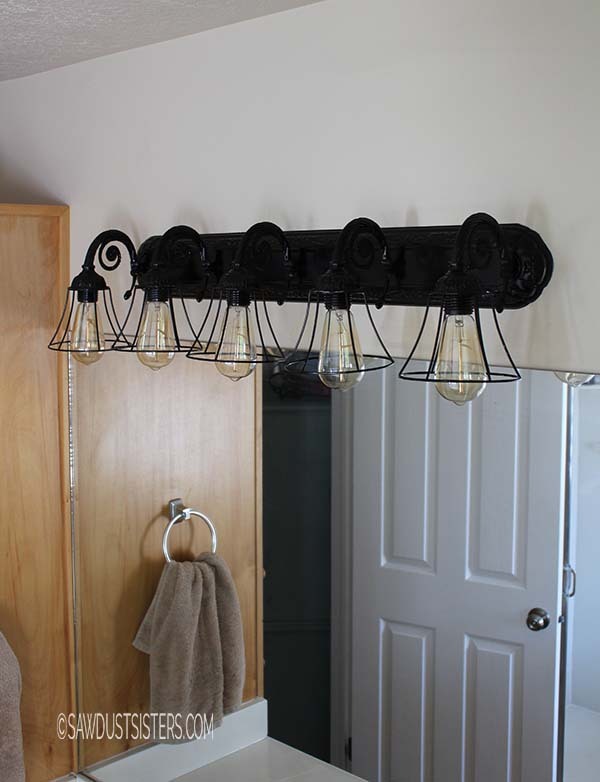 This bathroom light fixture makeover turned out so much better than I ever imagined.! Read on to discover how to replicate the look in your own bathroom! 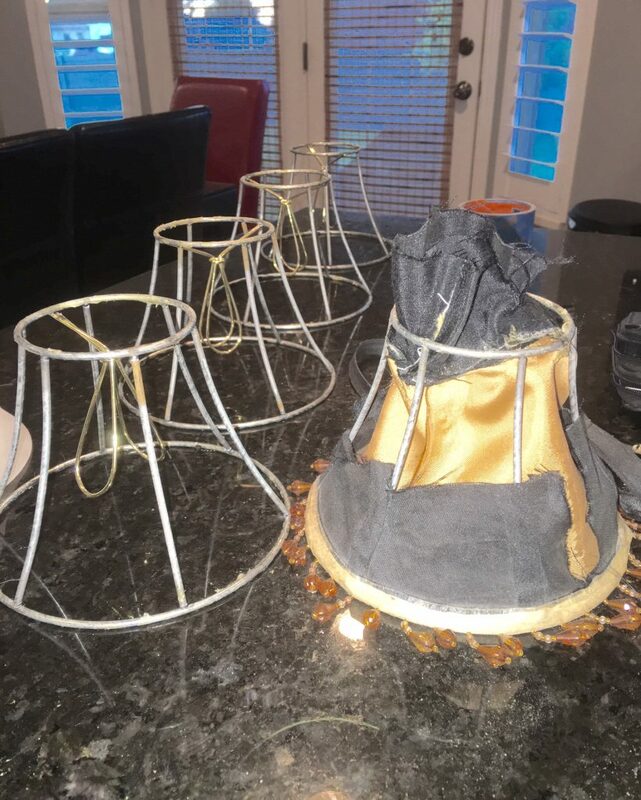 I knew I had to think creatively in order to spend less, so I headed to the thrift stores to find something “metal-like” to replace the white bell shaped bulb covers. 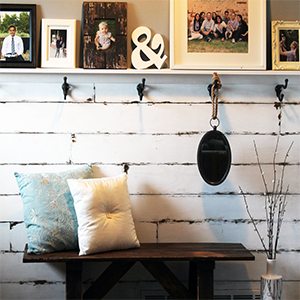 I wanted to find something a bit industrial/farmhouse. I was even thinking of making cages out of wire fencing. But then, I saw these little lamp shades for .75 cents a piece. I could feel the wire frame inside so I took a chance on them. I stripped them down. Yes my friends, beauty is indeed, found within. I was so happy they were almost exactly the same size as the existing light bulb covers. I removed the middle piece by just twisting it off. Then I cleaned up the frames with Goo Gone to remove the adhesive. 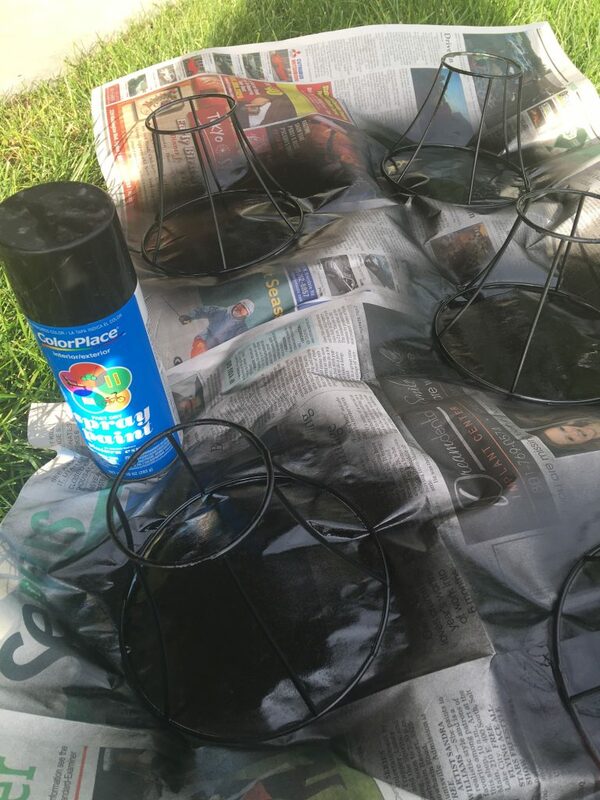 I gave them 2 coats of black spray paint. I did not want to deal with taking the light fixture off the wall and all of the electrical blah blah blah it would entail. I talked to my sister Beverly (my personal DIY consultant and sister in sawdust) and she said “I spray painted mine while on the wall” Hmmm. OK. Sooooooo, I tried it. Disclaimer: My bathroom has plenty of ventilation (2 windows). I also wore a mask and ran a fan while I was painting. It is also a good idea to turn off the breaker (I totally forgot to do this). Removing the fixture and spray painting outside is the best option if it doesn’t intimidate you. Since I wanted to paint the whole thing black, I stuffed some newspaper inside the holes where the light bulbs go, to keep the spray paint out. I was very careful as I sprayed. I did small sections at a time holding up a piece of cardboard close to where I was spraying. After a few minutes I was done! I did have some spray paint “dust” in random places in the bathroom, but everything wiped right off. I just had to give the bathroom surfaces a good wiping after I was done. 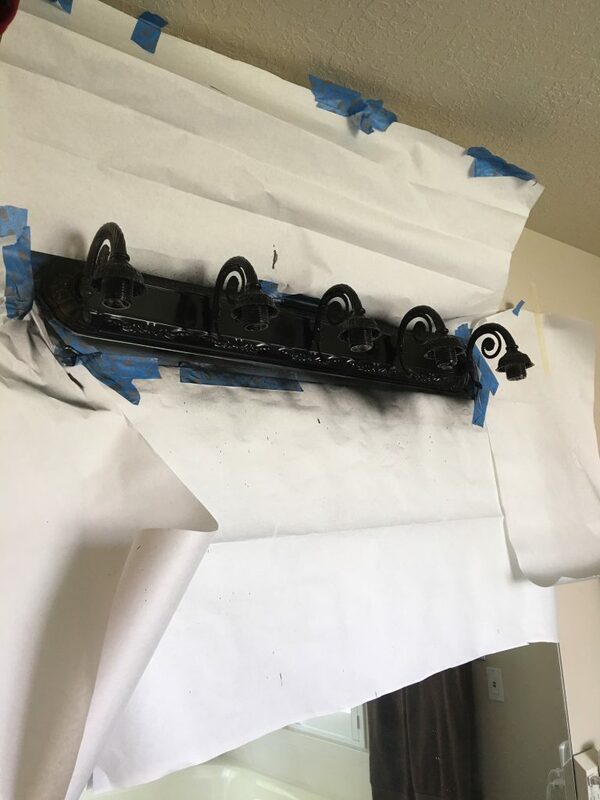 After I was finished painting, it was just a matter of putting the cages on, which thankfully rested perfectly on the fixture without any alterations. How lucky is THAT?. And of course these awesome Vintage Light Bulbs are the icing on the cage…. (did you catch that??….)! Here are some pictures of the finished light fixture. I am so proud of this light fixture makeover. This update has been a catalyst for a few other projects in this bathroom. It’s a snow ball effect, isn’t it? Plus, I was done with the yellow looking cabinetry so I had to do something about it. I will update this post with links as soon as the projects are done. If you like renovating light fixtures be sure and check out our Master Bedroom Chandelier Makeover. It is AWE-some!!!! I also made over my basement bathroom with a $100 budget. Come on in and check it it out! This bathroom will be all finished soon. I would LOVE to share the reveal with you, so make sure you join my email list to stay in the loop! 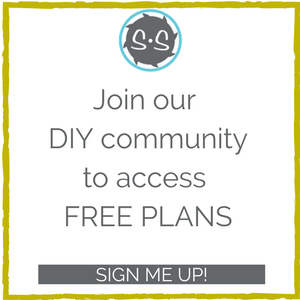 As an email subscriber, you will also have access to my resource library of free plans and printables! Let’s be DIY pals! This is brilliant my friend! My bathroom cabinets are the same color as yours and I am itching to paint them. I love that project!! What a great vintage/steampunk look to the whole thing! Where did you get the lightbulbs? Very chic. quick question, do those bulbs have an amber glow? 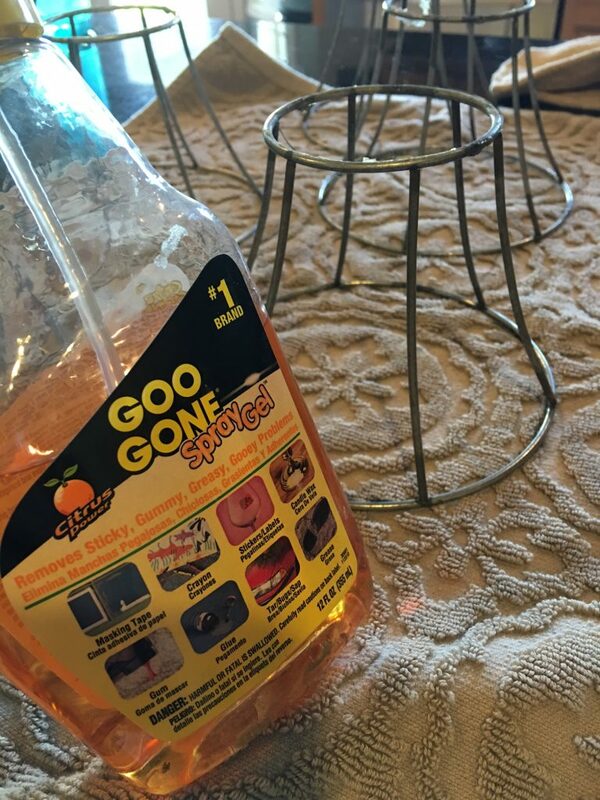 I bought some for dining room fixture and the lighting was an amber glow. don’t know how I would like in the bathroom. Thanks! I LOVE LOVE LOVE the way the light turned out! I think I’d paint the cabinet black also! And add some cool gold or crystal clear knobs. Thanks Nikki! Really??? Black? I hadn’t thought of black but I’m intrigued! I love the idea of the gold or crystal clear knobs!! Thanks for taking the time to comment! My friend used General Finishes black gel stain on her wood kitchen cupboards The cabinets turned out amazing; the stain allowed the wood grain to show thru and didn’t look quite so harsh as paint would. With crystal knobs, your bathroom would rock! This turned out great. I love how easy and cheap it turned out. Thank you for linking up at Dishing it and Digging It link party. We love having you. Hi Janice! These turned out fantastic! So creative!! I love this idea! Light fixtures in the bathroom can really take a beating from the moisture so it’s great to have ideas on how to refresh them. Beautiful transformation! 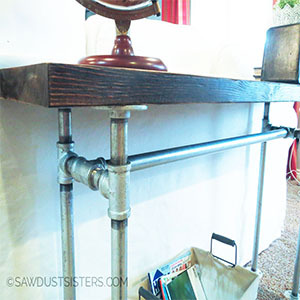 I love the industrial look and have wanted to incorporate it into one of my tablescapes. 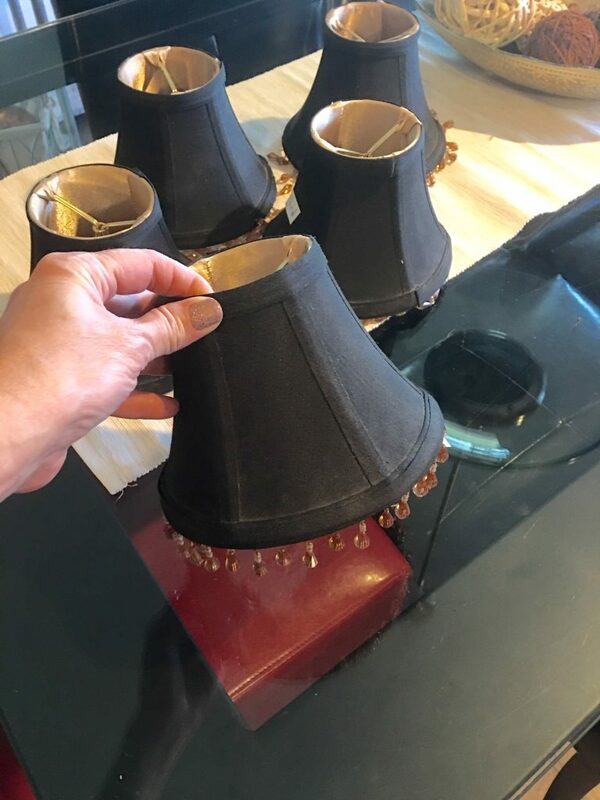 I have found lamp shades like those at the thrift store also. Thanks for sharing with us at Celebrate Your Story. 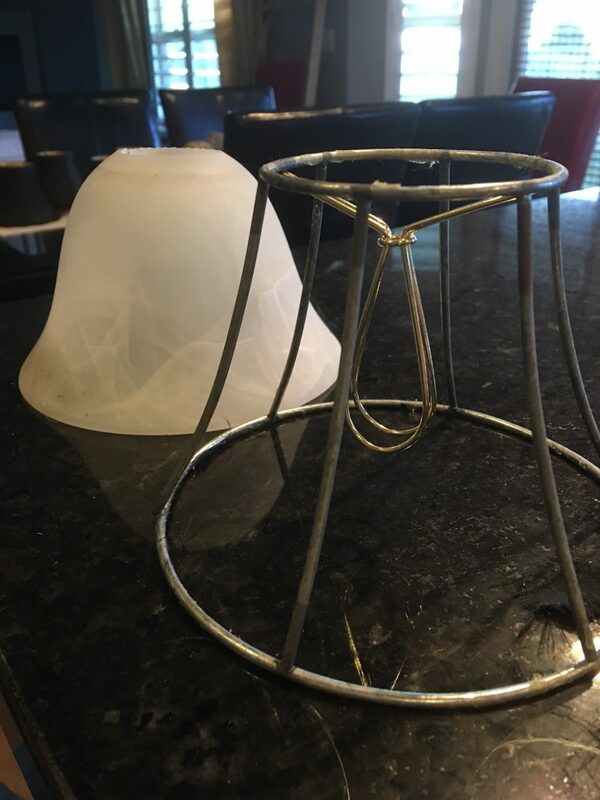 Your new light fixture looks fabulous! What a great makeover. I would never have thought to strip those down and use just the cages. Beautifully done! Pinning and Tweeting. Thanks for sharing at Snickerdoodle Sunday. Stopping back by to let you know I’ll be featuring your amazing light fixture at today’s Snickerdoodle Sunday Party. Hope to see you there! Yay! Will definitely stop by today. Thank you!! You’re a genius!! I LOVE this! I only wish I were as clever! 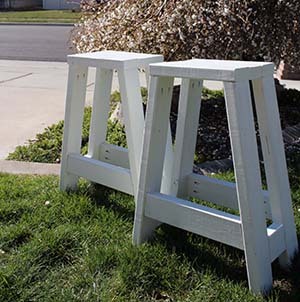 I can’t believe you transformed those thrift stores shades like this! Thanks for sharing at the Family Joy Linkup! Haha thanks Rachel! I love your enthusiasm! 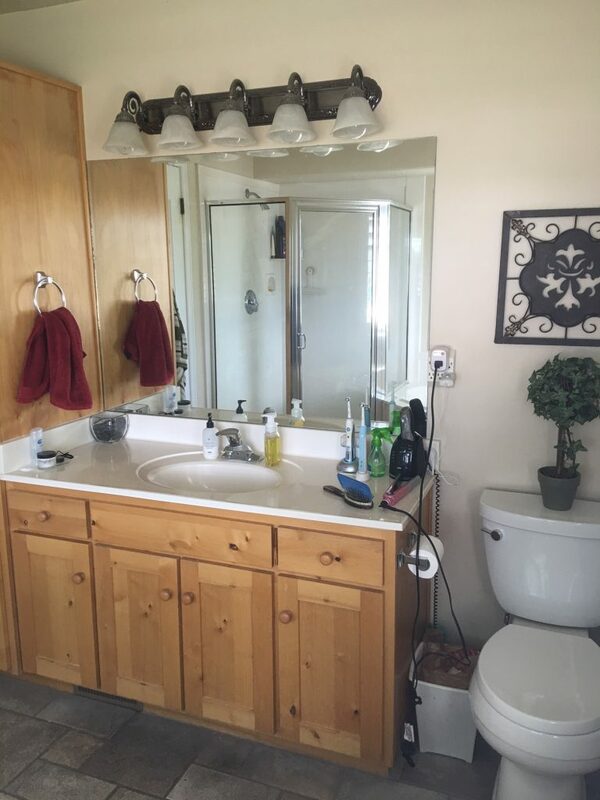 Great project, you totally changed that fixture! I wonder, I have an edison style bulb in a lamp and it doesn’t offer enough light. Do yours afford you enough light? I can’t wait to see the rest! Thanks for sharing at Celebrate Your Story! Hi Chloe! Good point! Mine are definitely not as bright as the previous bulbs but I did get 40W. I might replace them with 60W when they start going out. So far I don’t mind it unless it’s nighttime. I get a lot of natural light in the bathroom. Thanks for stopping by! These look better than anything that you could buy in the stores. Amazing! I would love for you to share at Totally Terrific Tuesday. It is still open right now. That is so clever! I can’t wait to see the entire bathroom makeover. This is just amazing! I love the industrial look of the the bulbs and wire shades, but the ornamental nature of the housing adds that feminine touch. Just lovely!! Thank you so much, Jen! appreciate your visit and your kind words! I love this and have already pinned it. Great job on finding the perfect shades for .75 each. What a bargain! You did an excellent job and I can’t wait to see more. Thank you Lisa! I saw the FB post. Thank you again. I’m so glad you liked it! Those are AWESOME!! We also have vintage bulbs in our kitchen and I love them. I never thought about saving the frame and tearing the fabric off a shade- that looks fantastic! I LOVE that!!! And spray painting with it still on the wall?!! You rock!! You are too creative! I was getting excited just thinking you were going to use the shades! 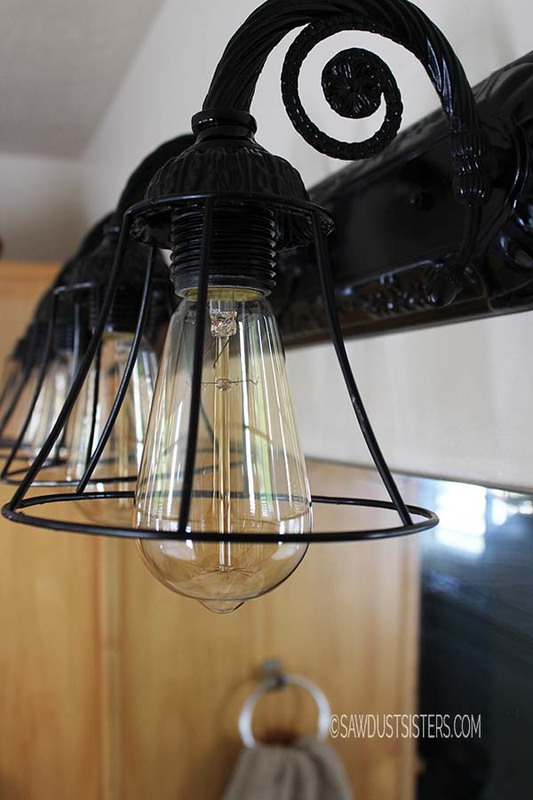 I thought oooh how I would love to update my light fixtures with shades…lovin a French country kind of look and then you left me gasping that you would do what you did and it so amazing! So amazing in fact that you will again be featured on TaDa! Thursdays at Chatham Hill on the Lake by votes of our Party Hosts. Thanks for joining again, but more so thank you for creative genius shared each post. Debbie you are too sweet!!! Thank you so much! I really appreciate you stopping by and commenting! I’m glad you liked it!! OMG how pretty!!! What a transformation! Thank you so much for sharing at our craft party on Thursday! Hope to see your next projects tonight! Thanks Denise!! How sweet of you! Very, very clever and creative! I enjoyed seeing your process. Outstanding. I’m going to try that frame–perfect solution for my very similar bathroom mirror. Glad to hear it Lisa! Thanks for stopping by and commenting! This is a terrific makeover. 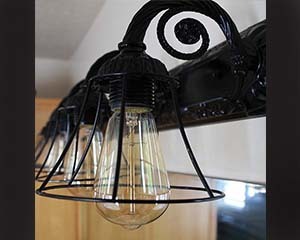 I am currently working on several light fixture makeovers, starting with convincing the other half its a good idea. This is great work. This would be perfect in our son’s bathroom. Thank you for the gorgeous idea. You rock! Soooooooooooo much better – LOVE!!! Wow! Totally unexpected! When I saw the first images with the things stripped off, I said to myself “looks lie a process”. But then the end result is unbelievable. Pinning! Thanks Zan! Ir was a bit of a process but totally worth it! 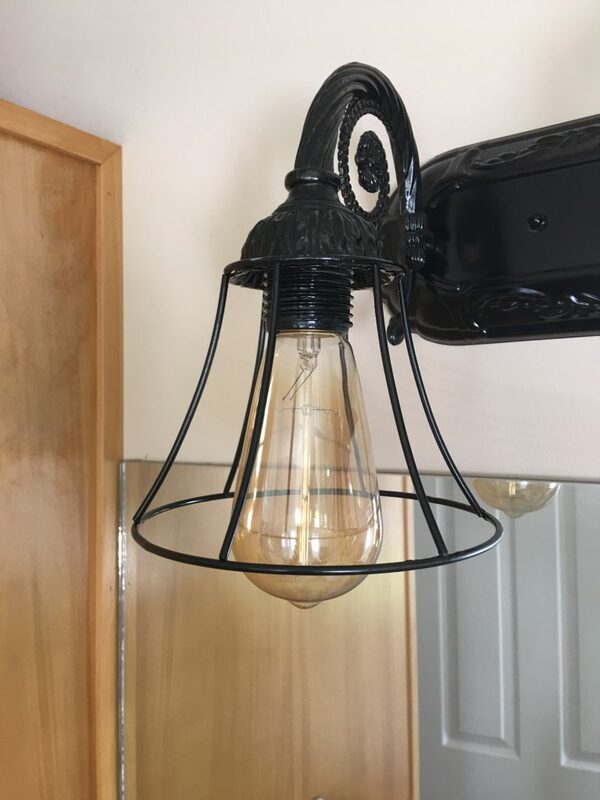 How did you attach the shades to the fixture? Hi and thanks for stoppping by! 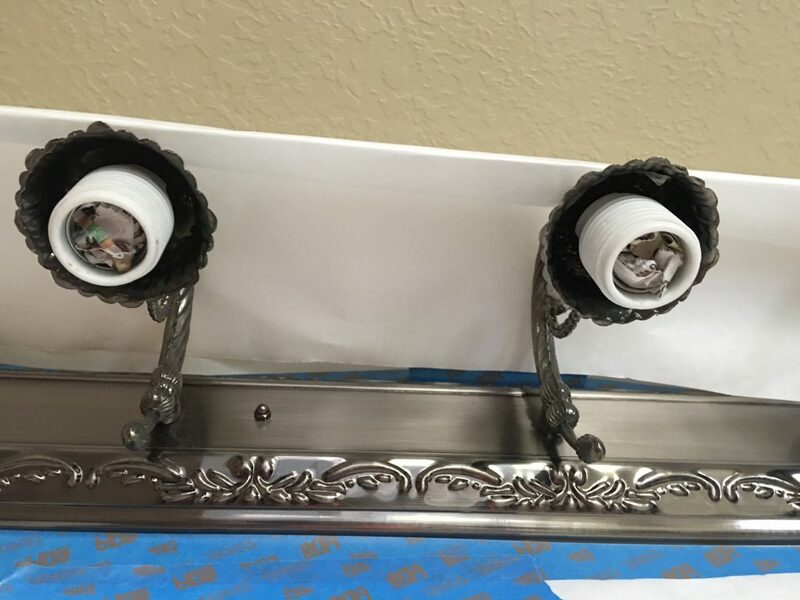 The shades are actually resting on the fixture, they’re not attached. Beautiful! How did you get the metal shades over the light base that it sits on? Seems the shade ring would be too small to get over it. Thanks! Thank you, Mary! It’s weird I didn’t think they’d fit either but I put them in from the bottom up at an angle, some slight twisting and turning and they slid on! This is so creative! Loved it. I would paint them a med gray. 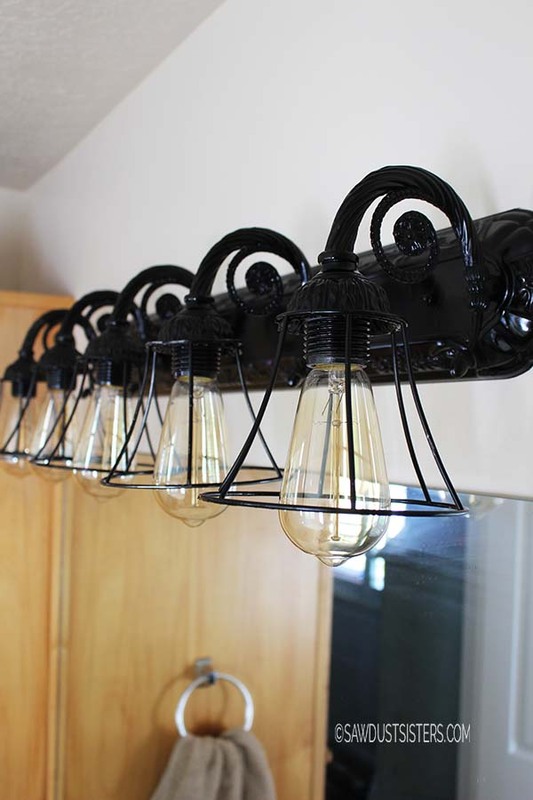 I am going to do these light fixtures in my bathrooms. What a great idea, thanks for sharing. Thanks for the suggestion, JJ! That is actually what I am leaning towards (I still haven’t done it!, lol). My hubby and I have talked about a more exten$sive renovation of this bathroom so I am pondering that! The vanity could be painted black but with a little sanding to give it an edgy look drawer pull in a brushed chrome pewter and some black and white picture or industrial photo in black frames , paint the walls a nice light grey color one with a touch of beige for warmth! Iron scroll deco on a wall! Good luck! 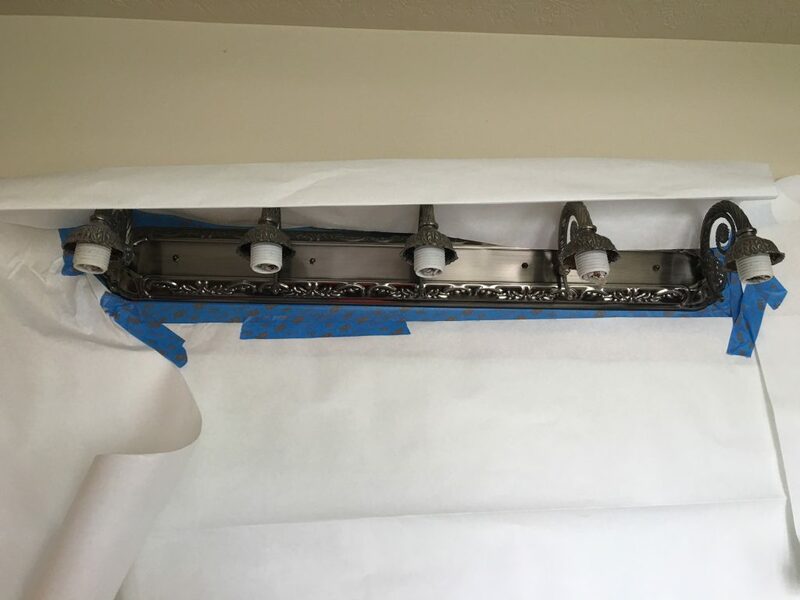 You and this project is the answer to my nightmare of what to do with my old bathroom light fixtures. Now I have the answer! To try and make my light fixtures just as pretty as yours, by doing the same things. Thank you sooooo much. Thanks Ivory! I’m glad you liked it! I love this idea so much, until I started implementing it. Now I have to rip the little shades off, then buy three bulbs. Thank you for sharing. Beautiful job! Hi! What a great idea! I am pretty sure these would look good even without the shades cages. (I would be curious to see!) I plan to do that with 2 or three lamp fixtures that came with a house we bought. Just take off the glass globes, painting the whole thing, and put edison lights. Yes Emily! I actually considered that! In fact, that was my Plan B had the cages not worked 🙂 Glad you liked them!! I love the that idea! I would not paint the cabinets they look beautiful! However, I would change out the top to a rustic wood plank or black top and an above the counter sink like those galvanized metal tubs. Would look super cute and you could change it out whenever you want. It also depends on the look of your room. Thanks for stopping by JoJo! That is a great idea. I love the vessel sinks too! Fab! Black cabinet absolutely, in fact I would as far as black accessories everywhere with white towels etc. How 1060 chic! !